After generating the PHP application based on your project, the next step is to upload the files to your server and set up the database. The generated files are saved to a folder you specify. 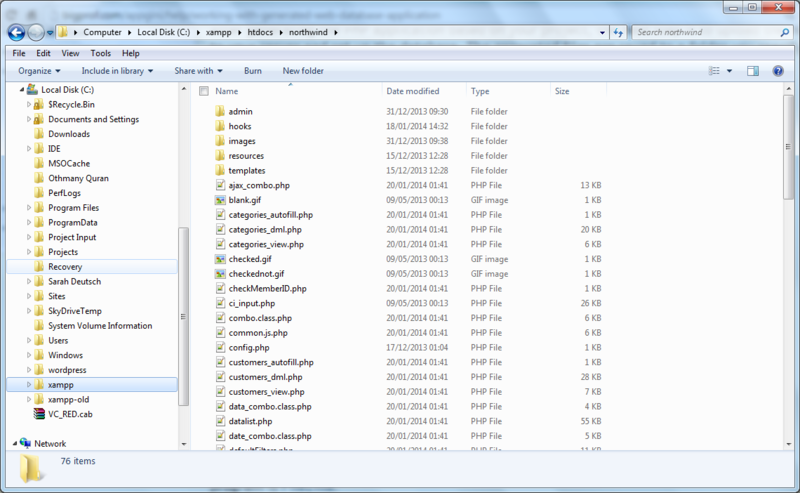 Below is a screenshot of a folder containing files generated from a project. To upload the generated files, you should use an FTP client. A very good (and open source) program is FileZilla. After you upload the files, you are ready to set up the database. Let's move on! Your database contains important information that you do not want any unauthorized person to mangle with ... So, only authorized users should have access to your database. As of AppGini 4.0, the generated scripts implement an advanced, yet intuitive, user management system. This system allows users to log into the generated application and have limited permissions that you (the admin) have full control of. The admin has access to an admin area where he can define groups. Each group has its own permissions over each table in your application. For example, let's say that you have created an application for storing clients' contacts, vendors' contacts, and employees' contacts. The admin can define a group called 'HR' which can view and edit only the employees' contacts, a group called 'Sales' which can view and edit only the clients' contacts, and a group called 'Procurement' which can view and edit only the vendors' contacts. Each group can have one or more members, and each member inherits his group's permissions. The following diagram explains this graphically. You can set the permissions of anonymous users in AppGini before file generation. And you can change them later from the admin area. Please be very careful with setting the anonymous permissions to avoid compromising your data. You may skip this section if you don't plan to modify the generated scripts. templates\categories_templateDV.html This file contains the template that controls the layout of the detail view form of the table. This form is where users can enter new records or edit existing ones. templates\categories_templateDVP.html This file contains the template that controls the layout of the printer-friendly detail view form of the table. templates\categories_templateTV.html This file contains the template for displaying each record in the table view. The table view is a list of the records in the table. templates\categories_templateTVS.html This is the same as the categories_templateTV.html, except that it controls the template for the selected record only. When users click on a record in the table view to select it, the selected record is highlighted in the table view, and its contents are displayed in the detail view for editing or deleting. templates\children-categories.php If categories table is displayed as a child of another table, this is the file used to format the child view. categories_dml.php This file contains the code that controls what happens on inserting a new record into the table, editing an existing record, or deleting a record. For example, you can edit the code for the insert() function to send you an email whenever a user adds a new record. This file also contains the form() function which controls the display of the detail view, using the categories_templateDV.html template file. categories_view.php This is the controller page that welds all the above files together into a single page. You can control several display options and permissions in this page.